The sea spiders are from the phylum Arthropoda and the class Pycnogonida. The largest sea spider lives in the deep ocean. They are found at times in depths of water up to 7000 meters, but it is more common to find them in shallower waters. The sea spider grows to be the biggest in Antarctica. They also live all around the world ranging from Australia, New Zealand, and the Pacific coast of the United States to the Mediterranean and the Caribbean Seas. They will also live as far as the north and south poles. They can live in a variety of climates, as well as in either deep or shallow water, and are able to live in both marine and estuarine habitats. 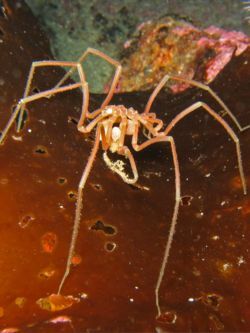 Sea spiders do not spin webs, but there is a water spider that does. Sea spiders are not like ordinary spiders you would think of when you think of a spider. The land spider is a fast moving predator, but the sea spider will move so slowly sometimes you cannot even tell it is alive. Ammothea verenae living near deep sea thermal vents. This page was last modified on 26 April 2016, at 12:44.